Tree- of-heaven (Ailanthus altissima), historically planted in urban landscapes and the inspiration for the title of the 1945 novel “A Tree Grows in Brooklyn, is threatening many of Ohio’s native forests. Originating from China and Taiwan, tree-of-heaven is often confused with our native sumacs. However, it can be easily distinguished by its distinct foul odor. It also typically has much longer leaves (up to 6 feet) and attains a much larger size (3 feet in diameter) than our native sumacs. Late fall and early winter is a perfect time to identify tree-of-heaven on your property because it holds on to its seed pods until after all the leaves of the trees have fallen off. This non-native invasive plant is a very aggressive competitor. The average female tree-of-heaven is capable of producing hundreds of thousands of seeds per year, and to make matters worse it aggressively sprouts when it is cut. Its seeds can travel great distances in the wind making tree- of-heaven is very effective at becoming established along forest edges, in forest openings and especially in recently harvested woodlands. 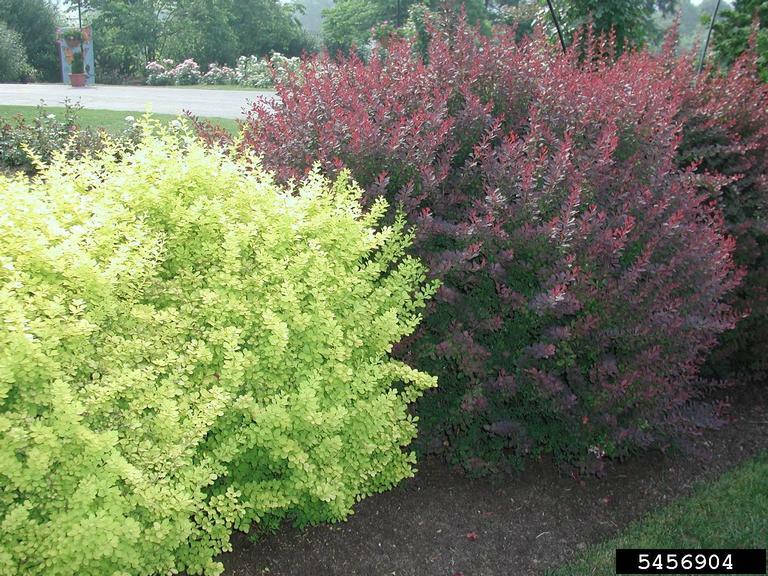 Once it becomes established, it can rapidly spread and displace many native tree, shrub and herbaceous plant species. If left unchecked, tree-of-heaven can negatively impact your forest’s ability to provide recreation, wildlife, timber and other benefits that you desire. 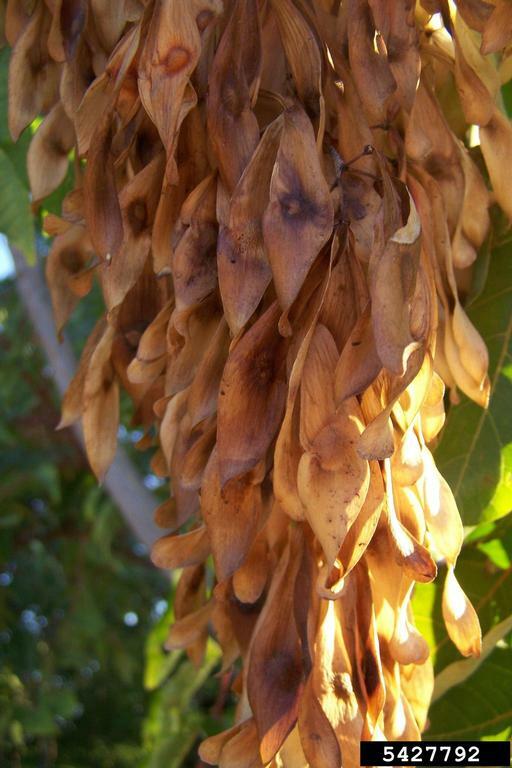 So what do you do if you think you’ve got tree-of heaven on your property? If you’re not sure, collect a sample and get confirmation. 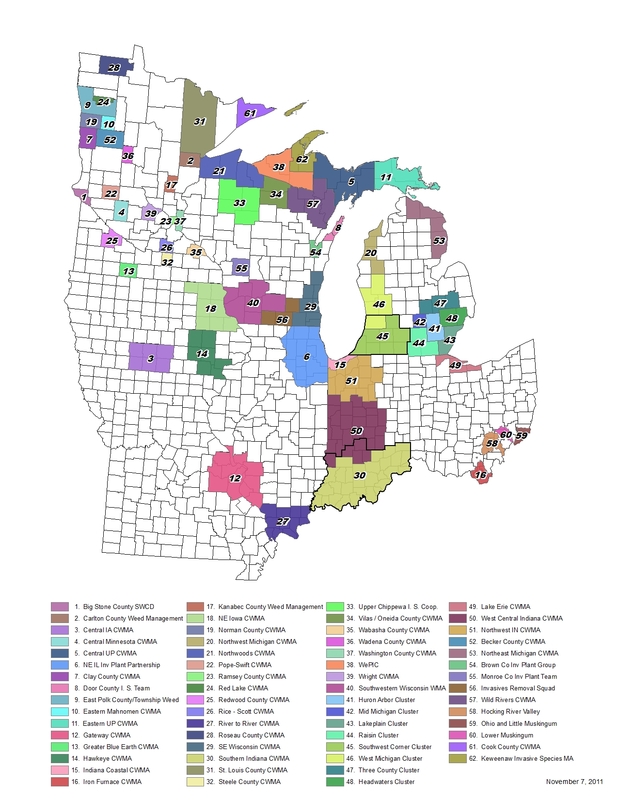 Your local Ohio State University Extension or Soil and Water Conservation District offices are a great place to start. Secondly, determine the extent of the infestation. You may want to seek assistance from your local Ohio Department of Natural Resources, Service Forester or a consulting forester. Evaluate your treatment options! Although it often requires follow up treatment, there are several herbicide treatment options available. 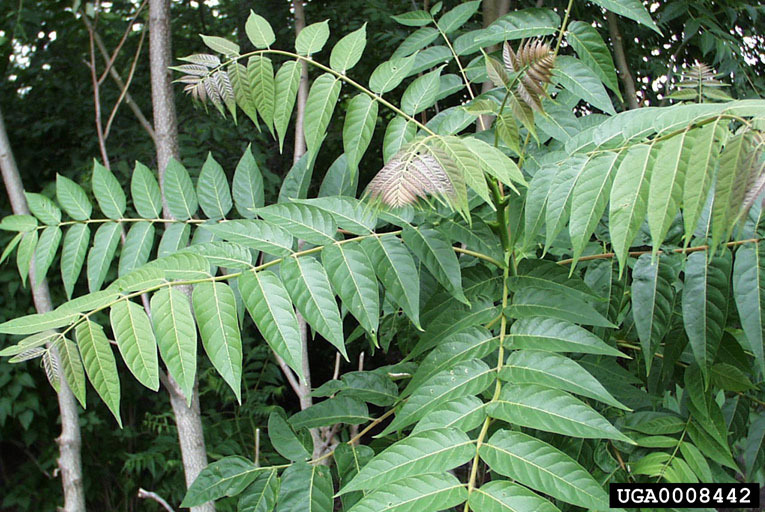 Controlling Non-Native Invasive Plants in Ohio Forests: Ailanthus”, Ohio State University Extension Fact Sheet, F-65-09 provides a detailed description of many of the treatment options available to woodland owners. Keep informed! A fungal wilt disease, which has been killing tree-of-heaven in Pennsylvania for nearly a decade, was recently found in Ohio providing hope for an effective biological control in the future. For more information about tree-of-heaven and other non-native exotic plants contact Eric Boyda at 740-534-6578 or appalachainohioweeds@gmail.com. Fall has officially arrived! The forest is once again adorned in vibrant shades of red, orange, and yellow, and so are many of the local homes and businesses. In fact, many of the decorations used in these homes and businesses are made from plants that were collected from our forests, such as Oriental bittersweet. 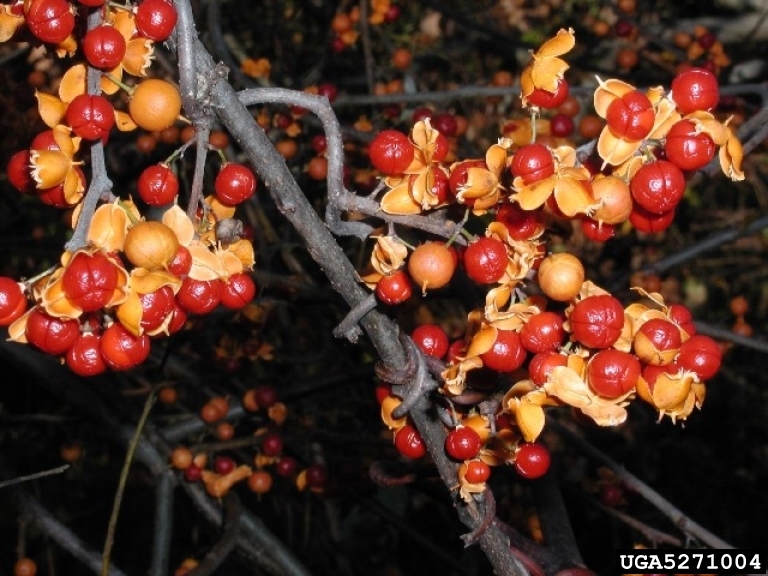 Oriental bittersweet was introduced to the United States, from Eastern Asia, in the mid-1800s as an ornamental plant. Its woody stems and persistent scarlet berries are an appealing addition to decorative, seasonal wreaths and ornamental floral arrangements. Despite its beauty, Oriental bittersweet can be quite beastly. It is an aggressively growing vine that girdles and overtops surrounding vegetation. 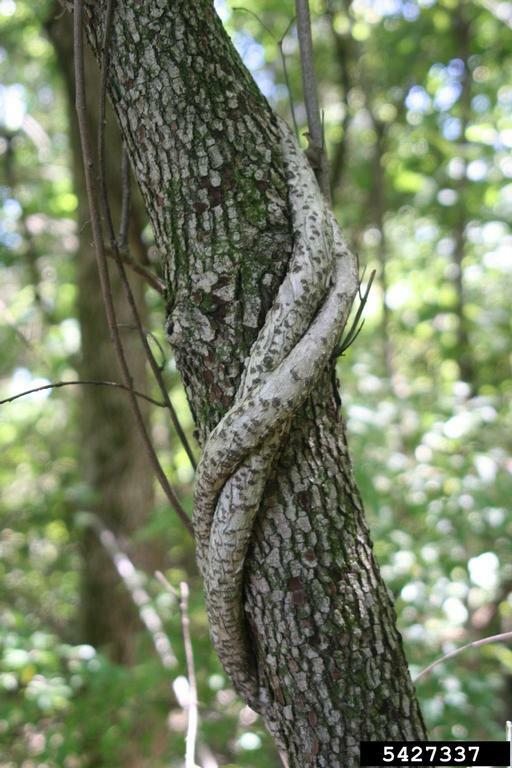 The weight ofmany vines can cause trees to fall, which can damage power lines, homes, and other trees. 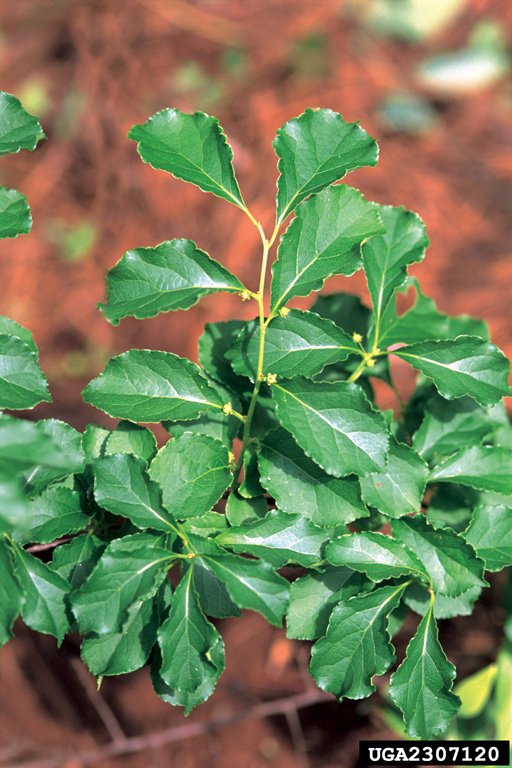 It can also prevent forest regeneration after timber harvest and can become a pest in agricultural production. The growth pattern of this plant drastically alters the landscape by out-competing other vegetation, thus limiting available food and habitat for wildlife. 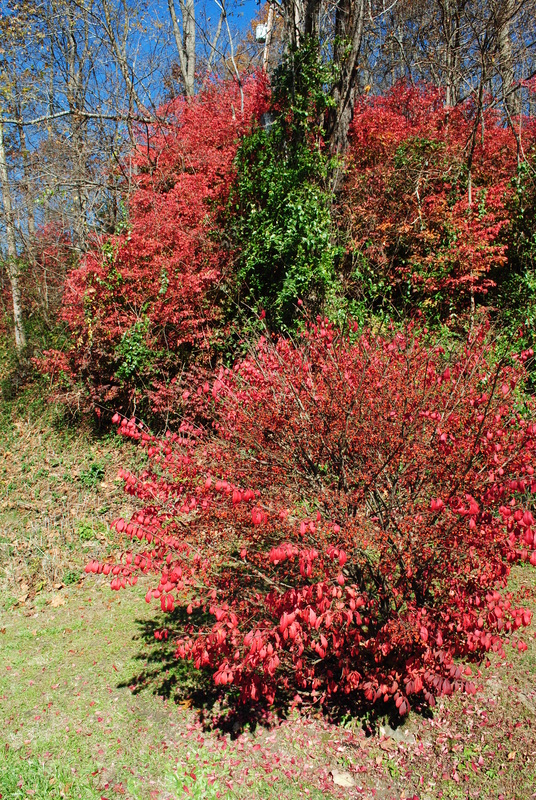 If Oriental bittersweet is left untreated it will hurt the economy of our region by impacting the timber industry, agricultural production, and recreational opportunities. Oriental bittersweet is found in old home sites, fields, forest edges, hedgerows, open woodlands, along road edges and other disturbed sites. Birds are the principal long distance carriers of seeds. However, seeds are also widely spread by people through decorative use of these plants in floral arrangements and landscape plantings. American bittersweet and Oriental bittersweet are known to hybridize in the wild and plants labeled as “American bittersweet” in commercial greenhouses are often mislabeled Oriental bittersweet. If you wish to add vines to your landscaping, rather than risk planting Oriental bittersweet, consider using native alternatives such as Virgin’s bower (Clematis virginiana), Virginia Creeper (Parthenocissus quinquefolia), Trumpet Creeper (Campsis radicans), and passionflower (Passiflora incarnata). Visit this factsheet for more information on Oriental bittersweet control – oriental bittersweet factsheet. For more information to help determine if you have American or oriental bittersweet, refer to this factsheet. You can also contact Eric Boyda of the Appalachian Ohio Weed Control Partnership by phone at 740-534-6578 or email at appalachianohioweeds@gmail.com.